*** Time for this post? Reading… 12 minutes. Viewing…13 minutes well spent. Doing the work…take the time while you have it. A Personal Directive (Advance Directive, Health Care Directive, Living Will) is an important piece of your paperwork. It’s the legal document in which you state your wishes for your personal care and medical treatment…or non-treatment. It only comes into effect if you are found to lack capacity to make personal decisions for yourself. 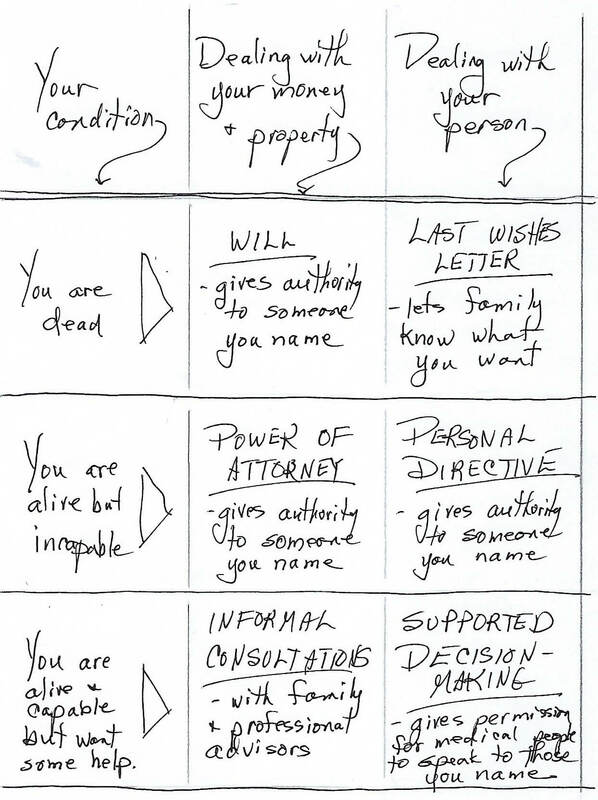 You need a Personal Directive as well as your Power of Attorney. Although both of them come into effect when you’ve lost your mental capacity to decide for yourself, the Power of Attorney can only address your financial matters. So a Personal Directive is necessary to give authority to someone you trust to make your personal decisions. Jim McDermott is a medical doctor who has seen plenty of life and death. In a compelling TEDx talk, he reminds us of the importance of initiating conversations about how we wish to pass when the time comes. He encourages us to think and act on our own convictions while we can, putting our wishes in writing so they are known by all who will be caring for us. Yourself… so you go in the best possible way. Your loved ones… to clarify your wishes and prevent emotionally upsetting disputes about what is best. Your doctors…to free them from their ethic of prolonging life at all cost. Your wallet…to prevent unproductive expenditures on treatments that make very little difference in the long run. Putting your wishes in writing isn’t easy—he’s right about that! Then I discovered Dying with Dignity Canada, an organization committed to improving our quality of dying, protecting end-of-life rights, and helping Canadians avoid unwanted suffering. You have congestive heart failure. You are always short of breath. Your swollen ankles make walking difficult. But your mind is still sharp and you enjoy time with family and friends. One day you have a severe heart attack and your heart stops beating. Do you want 911 called and CPR started? Their questions helped clarify my thinking. But they take it one step further, and recommend also using the questions to initiate conversation with those who will be in charge of decisions about you. To do this, they suggest giving a blank copy of the questionnaire to your agents and family members to answer the way they think you did. Comparing their answers to yours shows the discrepancies, giving you a chance to discuss and clarify your wishes. In so many cases, this sort of conversation is the missing piece in end-of-life preparations. The questionnaire process facilitates it beautifully. You can find their planning document at the Dying with Dignity website. If you live in Canada, scroll to the bottom to find the version tailored to your province’s legal requirements. If you live elsewhere in the world, pick any province and use the booklet for the thinking process. Then do some research to learn about the legalities and appropriate forms where you live. 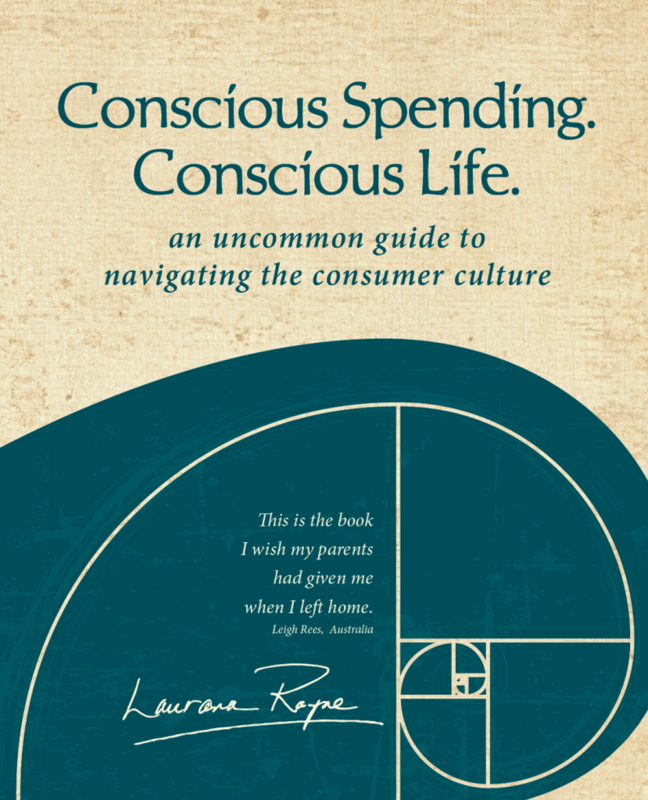 A Living Will or Personal Directive does not apply to your financial decisions. It only applies to personal decisions—those about where you will live and what sort of medical care you will agree to have in various circumstances. You make your Personal Directive while you are still mentally sound. In it, you specify what you want to happen to you in the time before death, and appoint someone, known as your agent, to speak on your behalf when you cannot. It is a legal document that comes into effect when you have been deemed incapable of acting on your own behalf. When making your Personal Directive, be sure to check the legal requirements where you live. In Alberta, a Personal Directive is optional and voluntary. However, when one is made, it must meet certain prescribed conditions to be legally valid. To be legally binding, a Personal Directive must be signed, dated, and witnessed. A lawyer can do it for you, but that is not necessary as long as you research the legal requirements and follow them carefully. Your Personal Directive is not written in stone. You can change your mind and write a new directive at any time. Since it does not require assistance of a lawyer, it won’t cost anything except your trouble in arranging for someone to witness your signature. In Alberta, a witness MAY NOT be the person you named as your agent, the spouse or partner of the person you named as your agent, your own spouse/partner, or anyone under the age of 18 (the age of majority). The witness is not required to read your document or approve its contents. The witness is there to actually see you sign the paper. That means you must complete the document except for your signature before meeting with the witness. You sign first, and then the witness signs. 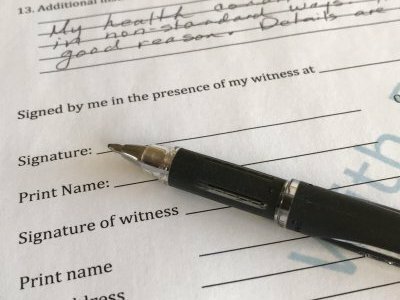 If ever asked, your witness would be able to swear that he or she saw you sign the document. Before meeting with the witness, make several copies of the unsigned but complete directive form. Both you and the witness sign each of the copies. this means that you and your agents each have a document with original signatures, which will be helpful when they need to use it. Once your Personal Directive is signed and witnessed, you may want to make copies and send them to your family. This is not legally required but will help ensure there are no misunderstandings about what you want. You may also wish to leave copies with your doctor, lawyer, and/or clergyman. Dementia presents a unique situation because it can take 5 to 20 years for the end of life to arrive. You might want to give thought to the kind of medical care you would want at various stages if you were to develop worsening dementia. I recently discovered an excellent health directive for dementia with clear and direct explanations. It was developed by Dr. Barak Gaster, a medical doctor who teaches resident physicians in the clinic at the Memory and Brain Wellness Center, University of Washington. He knows a lot about the ramifications of dementia. The standard advance directives tend to focus on things like a ‘permanent coma’ or a ‘persistent vegetative state,’” Dr. Gaster said. “Most of the time, they apply to a person with less than six months to live. Although it’s a terminal disease, dementia often intensifies slowly, over many years. The point at which dementia patients can no longer direct their own care isn’t predictable or obvious. That just gives you the flavour of what a dementia directive is about. It’s worth considering. 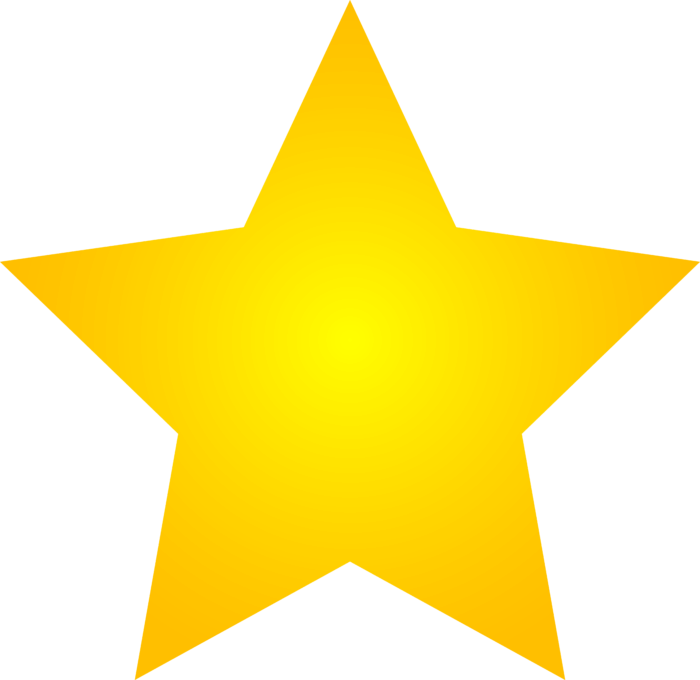 PS I just printed the graphic with the stars and attached it to the front of my directive because I felt the document was still lacking in the spirit of what I want. I think this does it! If you’d like to print the page I used, click on the image below. PPS Laws vary between provinces, states, and countries. I’m using information from where I live to illustrate principles, but you will need to check the details in your jurisdiction. The Internet is a good place to start. *** Time for this post? Reading…5 minutes. Listening…4 minutes. Smiling…for as long as you can! Maybe you’ve asked the lawyer to prepare your Power of Attorney at the same time. Your Will and Power of Attorney direct what happens to your money and belongings. But what about you, your person, your being? After you’ve died, what do you want done with your body? How do you want to be memorialized? Who do you want notified of your passing? Who will know what you want? 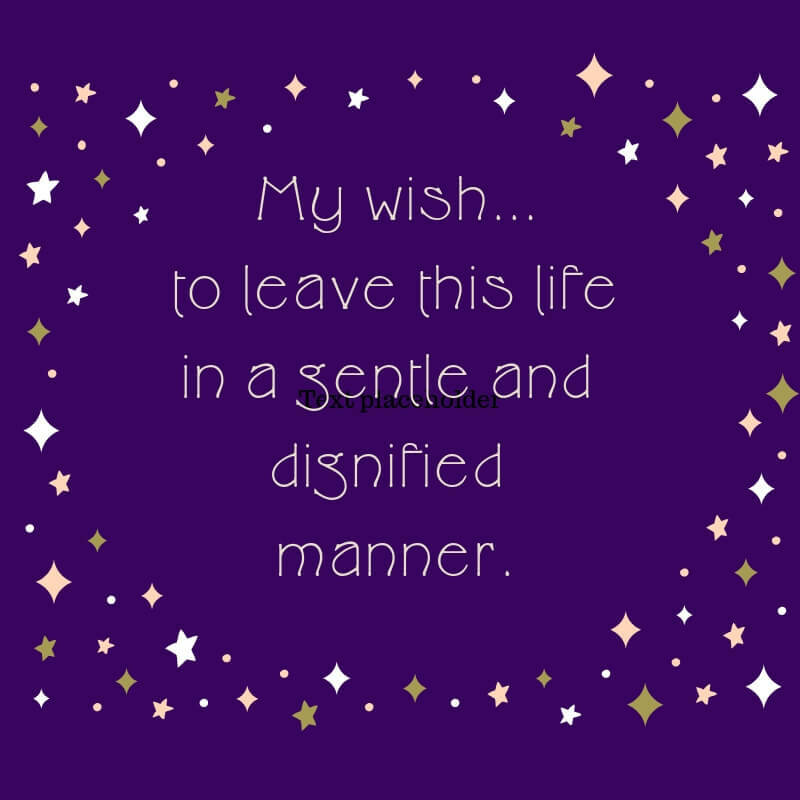 No one, unless you tell them.That’s why you should write a Last Wishes Letter. Here’s one more scenario. Suppose, as you age, you are still mentally competent but medical appointments and information have become daunting at the same time as your medical conditions are becoming more complicated. You’d like your adult children to be able to speak to your doctor to clarify. Because of strict privacy laws these days, doctors are not at liberty to divulge information about you to anyone, not even family, unless you have completed a Supported Decision-Making Authorization. So…that makes a total of five documents. Some apply when you are alive, others only after you have died. Each is important in its own sphere of influence. Here’s the full picture. Click here for a printable version. All except your Last Wishes Letter are legal documents, but only the Will and Power of Attorney require visiting a lawyer. The Personal Directive and Supported Decision-Making Authorization must be witnessed, but you can fill out the forms yourself and arrange to have your signature witnessed. Playing For Change is a movement created to inspire and connect the world through music. The idea for this project came from a belief that music has the power to break down boundaries and overcome distances between people. You can listen to many more of their Songs Around The World on their website. Next week…Personal Directives. If there are questions you’d like addressed, leave them in the comment box below so I can include the answers next week.